Christmas day started out foggy here so when the bright sunshine burned through the heavy grey clouds it turned into a beautiful day. We haven’t had any rain for quite a while and no snow in the mountains surely bummed out a lot of skiers over the holiday. I can’t remember the last time I took something I baked out of the oven on a bright sunny day so I was pretty excited to grab my camera and head outside to snap a few pictures. Sun glorious sun shining down on my California Style Gougères, hallelujah it really felt like Christmas day! We entertained a small group of family this year, our son, daughter, son in law and their three children. 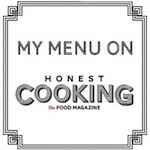 I decided to make a few recipes from Dec 2011/Jan 2012 edition of Fine Cooking. I made the spice rubbed roast beef tenderloin with red wine sauce, the mashed potato and changed it to turnip gratin and the braised fennel with orange. We loved all of these dishes but my favorite was the braised fennel, I will make it again soon and post a few pictures and the recipe. I make gougères often for an appetizer. I like to use Gruyère cheese although they can be made with different cheeses such as Comté or combined with Gruyère and Parmesan. They can be made small or larger, filled with mushrooms, or meat and served as a hot appetizer. We serve them as an hors d’oeuvre or starter with sparkling wine or Champagne- when we really splurge. Gougères are a French cheese puff which are originally from Burgundy. They are commonly enjoyed served with a Kir or Kir Royal which is white wine or champagne made with a small amount of crème de cassis. This time I changed things up by using a regular size ice cream scoop to form the gougères and a slightly different recipe from Around My French Table’ since I’m cooking my way through this wonderful cookbook. 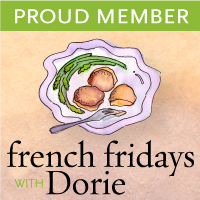 The recipe for gougères as well as cream puffs can be found here at All Things Considered Considers Cream Puffs and of course in Around My French Tableby Dorie Greenspan. I think the group made this recipe a year ago before I started because I can’t imagine missing this one! I also made a batch of profiteroles with chocolate sauce for dessert using the cream puff dough which worked out nicely. We were given several pints of Graeter’s premium ice cream which included chocolate and peppermint stick flavors so I just had to share the wealth with my kids. Normally my gougères fresh out of the oven look like these in the photo below that I took on my kitchen table. I make these often using a generous rounded tablespoon of the dough but I was feeling so very generous, I guess, that I pulled the ice cream scoop out of the kitchen drawer and went to work forming the big bun size pictured above. I also used a little trick that I picked up from a friend of mine who is an expert gougère maker, that is to sprinkle a generous pinch of Gruyère cheese on top before placing the tray in the hot oven. They are fairly simple to make but there are a few things to note about the recipe to make things go smoothly especially the first time making these cheesy puffs. It’s important to have all the ingredients measured correctly and ready by the stove before lighting the flame under your medium size heavy saucepan. After bringing the 1/2 cup water, 1/2 cup milk, 8 tablespoons butter and 1/2 teaspoon salt to a boil, add all the 1 cup flour at once, lower the heat and stir with a wooden spatula for a few minutes until you have a smooth dough. Take the pan off the heat and if you’re feeling strong you can beat each of the large 5 eggs in the dough, one at a time, with your wooden spatula until the dough is shiny. Turning the dough out of the pan into a standing mixer works very well, you can beat one egg at a time into the dough and beat for several minutes until shiny, then add the grated Gruyère cheese(about 5 ounces plus extra set aside for the tops) or combination of 3 to 1 Gruyère -Parmesan is also nice. It’s important to form the dough into balls, which ever size you prefer, as soon as you’re finished adding the grated cheese. Be sure to leave space between the dough balls on the baking sheet especially for the larger ones as they do expand a bit more than their smaller friends. Place the baking sheets lined with silpats or baking parchment into a preheated 425° oven, immediately turn down the oven to 375° and bake for 25 to 30 minutes for the larger gougères. I wouldn’t open the oven to rotate the trays, until they’ve been baking for a good 20 minutes. I never rotate the trays when I bake these, they bake evenly in my oven but I know that’s not the case with every oven, so check to see if the gougères are baking evenly in your oven before rotating the trays. Bake until they are nicely puffed and golden in color. Cool on a metal rack. Your gougères are GORGEOUS! I've always wanted to make these. So glad you shared your tips…and your (as always) fab photos! Gougeres are my favorite treat this time of year, but I have never made such gorgeous, giant-sized, fluffy ones! Seeing them in the California sun really does make one smile I'm so glad you had a happy Christmas! I came to FFwD a few weeks in & missed the gougeres as well (It was the very first recipe they did); someday, I need to come back around to them. wow these look so good! Seems like you had a fabulous Christmas. Gruyère cheese is becoming my favorite cheese now! Sounds like a great x-mas to me. I loved these and I'm glad you told me about adding the cheese on top. I have been craving these ever since. I think we need to start brainstorming what we are baking next. Do you think these can be made without butter, cream and cheese as to fit into my new healthy lifestyle, lol? Happy New Years. This was the first recipe we did in the group and it was a great way to kick things off. I'm glad you did a catch up on these – your version is gorgeous (as usual)! I hope you had a wonderful Christmas! These are gorgeous! I made them with FFWD but they weren't as pretty as yours. I hope you had a wonderful Christmas! What great looking gougeres – so golden! Hope you and your family had a great Xmas. Love the icecream scoop tip! Those cheesy puffs look heavenly!I am going to make them with a mix of Parmesan and Gruyere. Oooh, I love the idea of GIANT gougeres!! So yummy!!! Hope your holidays have been wonderful, my friend! Patty-those Gougeres look so light, puffy, and delicious. Would love to have some of the amazing Roast beef tenderloin with the red wine sauce you made…wow! For Christmas day, I had to start real early to make an 8lb stuffed hen, with chestnuts and sage bread stuffing, w/mashed potatoes, we had a Christmas lunch, so the rest of the day was relaxing! Sounds like the perfect and nice Christmas celebration you had with family, and small group of friends, Patty! I would love one or two of your giant-size gougeres right now, Patty. They look wonderful and looking at your photos makes me want to make them again soon. I'm glad the sun came out for you on Christmas Day! Wow they are perfect and they do look so light and fluffy. Have a Healthy and Happy 2012. Woww.. son hermosos y lucen esponjosos una delicia al paladar ,yo quisiera estar alrededor de tu mesa francesa y comiendo éstos excelentes gougeres,abrazos y felices fiestas un año nuevo lleno de bendiciones,hugs,hugs. I'll take 14 of the giant sized These look fantastic! I hope you had a lovely Christmas and wishing you a most wonderful New Year Patty! Your gougeres look spectacular! Beautiful photos too! Thanks for sharing! Have a very Happy New Year! These look fabulous! I actually bookmarked this recipe in my Fine Cooking – so thanks for testing it for me! Love that picture on the sheet pan – it's making my mouth water! happy new year to you. never heard of gougeres before. but they look insanely yummy to me. Patty, What beautiful gougeres! I love your large version…they had to be great served with your roast. Christmas in our area was rainy and cold…enjoy that sun! And have a wonderful Healthy, Happy New Year! They came out superb Patty!